Cynthia Barnett's Rain begins four billion years ago with the torrents that filled the oceans, and builds to the storms of climate change. It weaves together science—the true shape of a raindrop, the mysteries of frog and fish rains—with the human story of our ambition to control rain, from ancient rain dances to the 2,203 miles of levees that attempt to straitjacket the Mississippi River. It offers a glimpse of our "founding forecaster," Thomas Jefferson, who measured every drizzle long before modern meteorology. Two centuries later, rainy skies would help inspire Morrissey’s mopes and Kurt Cobain’s grunge. Rain is also a travelogue, taking readers to Scotland to tell the surprising story of the mackintosh raincoat, and to India, where villagers extract the scent of rain from the monsoon-drenched earth and turn it into perfume. Cynthia Barnett is an award-winning environmental journalist who has reported on water from the Suwannee River to Singapore. She is the author of two previous books, Mirage and Blue Revolution, a Boston Globe top 10 science book of 2011. She lives in Gainesville, Florida with her husband and children. Visit her website at cynthiabarnett.net. "Mesmerizing and powerful history. Barnett is a passionate, intrepid journalist whose research has taken her everywhere from a Mackintosh factory in Glasgow to a rickety suspension bridge, made of steel-wire rope, 30 feet above India's Simtung River during monsoon season. Her cultural references are equally far-reaching... Abundant details, spiced with irreverence and humor, are what make this book so delicious. What elevates it and makes it important is Barnett's exploration of humanity's attempts throughout history to prevail over the elements... Reading this book, we are witness to the profoundly flawed, hubristic core of human nature itself." “Barnett sets an ambitious goal, making something so everyday interesting, even fascinating, and she accomplishes that with far-reaching research and lyrical prose, tracing rain through literature and myth, science and history....In a state where the governor has prohibited the discussion of climate change, Rain is as welcome as a summer afternoon shower on a hot day." "With Rain, Cynthia Barnett will make a rain fanatic out of anyone, not just self-described weather aficionados...Through her approachable and engaging writing, Barnett tells this eclectic story by combining science and history with humor, anecdotes, poetry, and personal travel adventures...Barnett captivates the reader through her unique way of finding a human face to describe historical climate and weather events...In a particularly memorable chapter, 'Writers on the Storm,' Barnett explores the role that rain has played in the creation of art, including the works of Charles Dickens, Emily Dickinson, Frédéric Chopin, The Smiths, Nirvana, and Woody Allen." "Cynthia Barnett’s eye-opening book is enough to make even the most fervent rain-hater experience a change of heart. From the storms of biblical proportions that lashed the Earth when it was newly formed to why Woody Allen prefers to shoot against a rainy backdrop, Barnett addresses rain’s role in science, culture and history with a forensic eye for detail and a good sense of humour." "Barnett approaches her subject with full recognition of [rain’s] mystery, bringing to it a cogent understanding of rain’s complex part in the hydrologic cycle….She excels at explaining the complexities of that cycle and the consequences of our modern compulsion to manipulate it…Barnett, often wittily, packs her book not only with essential finding, but also small, strange facts: that raindrops, for instance, don’t resemble water dripping from a faucet; rather they fall from the clouds in the shape of tiny parachutes, their tops rounded because of air pressure from below." "Lively, wide-ranging, and sensitive...Entertaining as well as wise...Barnett uses rain as a prism through which to gaze at a much larger picture—one in which the human desire to control the world often rebounds in unfortunate ways, and the equally strong desires to understand and appreciate sometimes compensate for the effort to strong-arm nature into submission." "A seamless blending of personal narrative with scientific and cultural explanations...Fans of Mary Roach will recognize a similar ease of style and interjection of wit…Accessible to every reader, from the environmental scientist to the parent choosing whether their child needs to wear a raincoat that day." 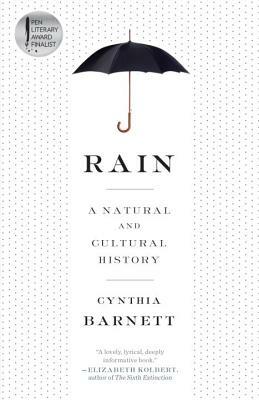 "A spectacularly vivid, all-encompassing history of rain... Like John McPhee, Jared Diamond, and Elizabeth Kolbert, Barnett illuminates a crucial subject with knowledge, energy, conviction, and a passion for mind-expanding facts and true stories." "Barnett beautifully evokes universal themes of connecting cycles of water, air, wind, and earth to humankind across time and culture, leaving readers contemplating their deeper ties with the natural world." "Rain is a lovely, lyrical, deeply informative book. It will change the way you look at gray skies, and sunny ones, too." "Rain—the thing the weatherman frowns about—is one of the planet's great pulses, as this marvelous book makes clear. Read it now, recalling the rainstorms we grew up with, and anticipating the harsh new rainfall that's coming our way on a warming globe." "Brilliant, insightful, and beautifully written. Raindrops are prisms through which we see the surprising and profound connections among water, human history, and our uncertain future." "Some of the most lyrical and surprising nature writing that I have ever read. This book is filled with wonder, as mysterious as the shape of a falling raindrop, which is not the drop we imagine, but a concave little parachute drifting to the earth below. After reading this, you will never look up the same way again." "Rain is one of the most elegant and absorbing books ever written about the natural world. Writing with grace and imagination, Cynthia Barnett takes you on a journey into the heart of the most elemental force in our lives. An important, revelatory, and thoroughly wondrous book." "Captivating and compelling, a delightful celebration of precipitation that is brimming with insight. Whether you’re desperate for more of it or you just wish it would stop, you’ll never think of rain in the same way again." "Cynthia Barnett looks at the human relationship to rain—from Noah, to Thomas Jefferson, to our own conflicted attitudes. The result is a book of unexpected connections and wonderful surprises. It will give you more respect for every rainstorm you experience, and more joy in the raindrops." "Barnett’s beautifully written book envelops the reader in warm shower of intriguing history and fascinating science. Anyone who looks longingly at rain clouds, rejoices in a spring downpour, or frets about drought, will love Rain." "Like the weather, there's no predicting the delightful and sometimes disturbing surprises waiting on every page of Rain. Whether she's writing about Mesopotamia or the Met Office, Cynthia Barnett illuminates the hidden connections that tie our fate to a precious resource we neglect at our peril." "Rain is one of those uncommonly wonderful books that are both highly significant and deeply pleasurable to read. As we face the coming time of storms, of flood and drought, nothing will be more important than rain. So all gratitude to Cynthia Barnett for writing a book that is clear, surprising, and filled with fascination." "If you care about this planet, you're lucky that Cynthia Barnett writes so elegantly and intelligently about the stuff that falls on it. It's kind of ironic--like rain on your wedding day?--that the folly of mankind's relentless efforts to control the earth's water has inspired Barnett's best work yet."